You are here: Home / Ethnic Groups / The People of Bali and Nusa Tenggara / Who are the Kangean? 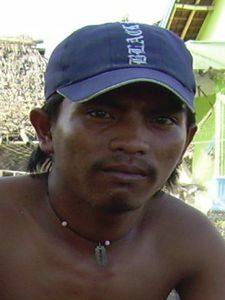 The Kangean people live on the islands of Kangean. The Kangean islands are about 120 kilometers east of the island of Madura and 115 kilometers north of the island of Bali. The Kangean island cluster consists of about 60 islands that spans 487 square kilometers. They use the Kangean language which is close to the Madura language. People on the Kangean islands are known to be very friendly, polite and religious. The community speaks multiple dialects of the Madura language. The Kangean dialect is used for informal day-to-day interactions. Education on these islands has not progressed very far. Middle school is the highest a student can attend in the national school curriculum. There are no high schools. Many who have finished their education move to other islands such as Java, Sumatra or Kalimantan to continue their studies or seek employment. Travelers to the Kangean islands would see many bicycle taxis waiting for passengers as they step off the boats. There are also many people selling various types of seafood, such as fish, squid, etc. Most people’s livelihood is centered on fishing, but there are also many farmers and traders. There has been some economic development in the Kangean island region, but the main form of transportation remains bicycle taxis or motorcycles. The fishermen use small carriages to transport their catch to the local markets. For daily needs, many items are bought from other islands such as Madura, Java and Bali. These commutes can last up to 18 hours one way. People can usually buy food that is sold on the other more developed islands, but the electric power supply is quite weak. The electricity is usually only on from the late afternoon until dawn. Islam is the predominant religion among the Kangean. It was brought to this area from Java, but the Kangean people possess a culture quite different from Java and other surrounding islands. Because of this, the Islam expressed here looks quite different from the Islam practiced in other places. Although most Kangean people would call themselves Muslim, animism is at the heart of their faith. Many of the people practice cultural rituals, believe in supernatural numbers, and magic. This is their way of expressing Islam in their cultural context. The Kangean people have several needs. Electricity and education are at the top of the list. Most people only have a small battery for power during the daylight hours, and many wait and hope for the electricity to be turned on at night. Children can only attend school until 7th or 8th grade. If the family can afford it, the children are sent to other islands to attend high school. Education remains one of their biggest felt needs. The largest need there is spiritual. The people of the Kangean islands have little or no access to the Gospel. They live in fear every day, hoping to appease the spirit world. They are afraid that something bad will happen to them if they do not appease these spirits every day. Many of them have rituals or practices to help them overcome this problem, but they still live in fear that it is not enough. Islam does not offer any hope of salvation or overcoming this fear of the spirit world.